Many conspicuous but disregarded species, such as Frogs, Salamanders, Snakes, Turtles, Mussels, snails, Leeches, and Crayfish are found in flowing water, and streams are the dispersal pathways by which they move between lakes and wetlands. A stream is the archetypical continuum, as classically expounded by H.B.N. Hynes, in The Ecology of Running Waters (1970). It goes without saying that to truly know a stream you should proceed along its entire course by swimming, floating, wading, shore-walking, skiing, and canoeing, in diverse water levels in every season (Poem 1). Every meander or riffle may support a species not found elsewhere in the reach or in the stream, every month has its specific biological events, every year is different, and rare species are especially likely to have sporadic distributions. Repeated surveys of streams are important, because of the changes wrought by invasive species, sedimentation, and pollution. But there's an enormous number of streams, and thorough longitudinal surveys often require switching between modes of transport when water depth or speed changes from one reach to another. In these automobile-mad days, numerous points along streams are uniquely accessible at bridges, where the stream can be quickly reached by vehicle, where a publicly-owned road allowance makes access unambiguously legal, and where the constriction of the abutments and shade of the span often produce a diversity of habitats. Other advantages of bridges as sampling sites include their replicability for others who come after, handy proximity to gear left in the vehicle, and an unambiguous rendezvous for canoe or wading surveys between roads. In weedy rivers, the best place to look for bottom-dwelling Animals is often in the unvegetated shade under a bridge. Species that require cover may inhabit only the riffles created by the rocky fill often placed under a bridge to prevent erosion, and during flooding the constriction of the bridge often creates eddies where drifted shells accumulate. On the Shield, the concrete of an old bridge or dam may add enough calcium carbonate to the water to increase the populations of shelly species below it, making the unique (and possibly rare) fauna of the stream easier to find and identify. Our goal has been to visit every bridge and lake outlet we can get to, assess the use of the bridge embankments by Turtles as nesting habitat, find which species of Crayfish, Unionids, and Salamanders are present, note the occurrence or absence of Zebra Mussels and other invasive species, and make collections that document the morphology and genetics of the populations. This article describes the procedures we've developed for these visits, hoping to inspire others to "do" bridges, offering them a simple protocol (Table 1), and presenting a few tips for safety and comfort. The latter day explorer must position himself on the globe and in time (Chapman & Wieczorek 2006), and be prepared to routinely measure temperature and magnitude. The basic equipment for this spatio-temporal referencing is a GPS unit or topo map, a digital watch or time read from a GPS unit, an accurate thermometer, and tape measure, metre stick, ruler, or calipers as needed. Equipment for streams includes strong plastic bags, effective wading shoes, a dipnet or rock rake with a sturdy staff-like handle, glass-bottomed viewing boxes, and permits or fishing licence appropriate for specimens you're going to retain. You must, of course bring the "breathless interest in natural phenomena" which alone qualifies you to record anything beyond a fixed data protocol. In streams this fascination should extend to the Hirudinea -- vulgarly "those damned blood suckers" -- or at least, if Leeches aren't a focus of study, an indifference born of the conviction that they're harmless to an investigator properly clad in tightly woven pants tucked into tightly knitted socks. It would be indelicate to suggest that our product theNatureJournal(.ca), is also essential, but you've got to have a method of recording your observations while you're at the site, whether pen-and-ink or electronic, that's tied into some prospect of long-term archiving of your findings. In any event, the herpetological origin of the datasheet from theNatureJournal predisposes it to bridges, since herpetologists rarely stray far from roads or from water, and accordingly flourish at their intersections. This sheet is derived from that devised by Jim Johnston and Francis Cook at the Herpetology Section of the Natural Museums of Natural Sciences in 1974. A version directed at Unionid mussels can be downloaded from the South Nation Conservation site. We're trying to delimit the places where individual species occur, not to assess the abstractly unidimensional "water quality" so beloved of government agencies. The basic data of both ecology and conservation are where organisms are found, and especially in these days of environmental insults, we can never depend on static distributions, so we build a list of species at each visit to each site. As adherents of Robert Wittaker's ‘gradient theory' of distribution, we know that each species responds uniquely to its environment (Wittaker 1967). Our goal is understanding the multidimensional Hutchinsonian niche of each species -- the intersection of ranges of tolerances for the habitat variables it needs, ultimately to be expressed as Hutchinson's "multidimensional hypervolume" (Hutchinson 1965). There are only a few cases where we've worked out to quantitative results, but only by repeatedly visiting as many bridges as possible do we have any chance of success. At the bridge, park safely and note the time of arrival. Then hop out of the vehicle for a general overview, and to take a GPS reading in the middle of the road at mid-span. Scan the road and shoulders for road-killed remains -- fresh, desiccated, or skeletal -- which will often, sadly, give you a good start on the herpetofaunal list for the site. Look for, and count, the digging of turtle nesting, or the egg-shells of predated nests. 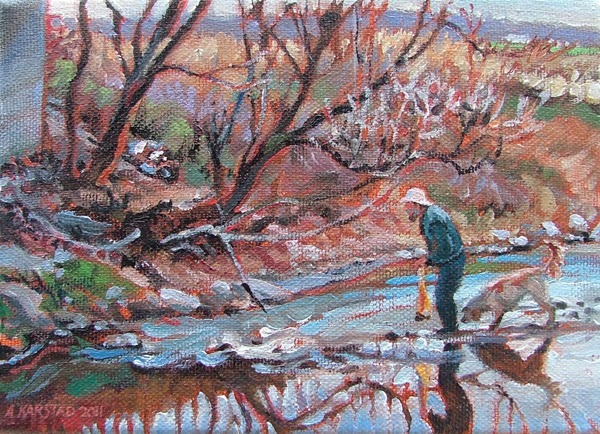 Then peer over the sides to check the character of the stream: where it will be easiest to get down to the river, and where does it look too deep for easy hunting? Will you be able to wade under the span? In some sites, as ‘bridge' converges on ‘culvert,' entering the dimly lit tunnel will call for troglodyte courage, but some species may be found only, or most easily, in this way. Inspect the shores for sites where drifted shells may have accumulated at the uppermost line of flooding, or been skimmed off by filters of grass from the current or eddies (see the Canadian Library of Drifted Material). When you've gone down to the water, gather these top handfuls of shell-rich drift, where they've been filtered out of passing water by sieve-like vegetation, winnowed by the circular movement of whirlpools or eddies, or tucked under a rim of overhanging sod. Scoop the richest handfuls into a plastic bag, insert a tag bearing a unique identifier, and tie it closed. Before entering the water, put on wading gear: boots or wetable shoes according to your taste. Be sure every member of the party has multiple bags, and that nets and view boxes are distributed to those who are likely to make the best use of them. Once the equipment is handed out, work down to stream level by finding existing anglers' paths, or clinging to the concrete of the abutment, remembering that in deep vegetation, there's likely to be a metre of mis-step right at the bank. One member of the party can stay on the bridge span to fill out a datasheet, sketch the scene, and write an account of findings, by direct observation and by shouted interrogation of the others below. At streamside take the temperatures of the air and water, and note nesting Birds, and Birds' nests, under the span. Check the underside of the span for deterioration that should be reported to the highway authorities. (footnote 4) Scan the habitats available and decide where you'll enter the water. In a rocky swift-flowing stream this may not make much difference, but in slower or muddy streams every movement will disturb sediment, and you'll want to work upstream as much as possible. Then wade in and start looking, turning over rocks that may shelter Crayfish or Mudpuppies, generally favouring the flatter rocks, and approaching them from the downstream side, so if there are ripples from the current you won't obscure what you're looking at with your own wake or with clouds of disturbed sediment. If the rock sheltered a Crayfish, it may swim off and require pursuit, or it may stay where the rock was. If it's swimming well off the bottom, you can lash out at it with your net. If it's on the bottom there are three options for capture. The more nervy, and/or experienced, try to catch it bare-handed, by grabbing it: cautiously you aim for the meeting-point of the cephalothorax and abdomen and press it against the bottom so it can't pinch you. Otherwise you boldly just scoop it up, not giving it time to mobilize its great chelipeds ("claws") to your detriment. 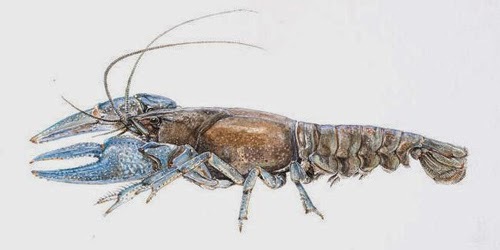 The third method depends on the Crayfish response of flipping backwards for a quick departure: carefully place your net behind the crayfish, and then, with hand, rock, or stick, poke around in front of it to encourage it into your net. After capture, identify the species from details of colour and morphology. If Crayfish are to be released, check the gender, and measure the carapace length. Flat rocks are more likely to shelter large inhabitants -- Crayfish, Salamanders, Catfish, or Burbot(Lota lota) -- than round ones. But you're not just looking for crayfish, you keep an eye out for mussel and clam shells too. Identify and measure living Unionids, and collect dead shells and some of the largest Zebras if they're present. Where they're not abundant, Zebra Mussels are most likely to be found on the underside of turned rocks, as is the introduced Faucet Snail, Bithynia tentaculata. In really muddy streams you may only be able to find Unionids (and the shells left by predators) by blind groping in the mud, both in the same mud where you see emergent living individuals and in places where Muskrats have, or ought to have, left shell piles. Just reach into the mud and dig out the shells; minor cuts on hand and fingers heal quickly, especially with the new healing Band-Aids. As you find interesting things (Molluscs, Crayfish, and beasts with too many legs to not be interesting), you place them in your plastic bag. The trick with a bag is not to drop it, not to tear it on branches, and not to let the pendulum of accumulated material impede the capture stroke of your net. Usually you just hold it against the net handle, but as it fills you may want to tie a loose knot and tuck it under your belt (or very securely into a pocket), or leave it conspicuously on the shore until your return. If Mollusc shells are washing into your net with the current as you turn stones, or are concentrated on the bottom (sometimes as a deposit of amazingly low-density sediment), you'll also want to sample this submerged drift into a bag. If you see any interesting fish, Amphibians, dead/shed Crayfish parts, shells, snails, anything else, identify them -- or, if you can't, show them to the member of the party best qualified to do so. Anything you can't trust yourself to remember accurately: write it down right away.Conspicuous Birds and Mammal sightings and signs also go into the notes. You move around, following the areas most likely to have crayfish and turning over rocks, not neglecting the margins of the water where you may extend the known range of Two-lined Salamanders (Eurycea bislineata) or find pupating Dobsonflies (Corydalus cornutus). Note plants of invasive species, and collect any plants that seem ‘unusual' to you (even if you're not able to name them, those that strike you as ‘odd' are likely of interest to those who can). If you're photographically inclined, smother the place with digital images, which make it easy to communicate what you've found and seen. Canada: Ontario: Ottawa-Carleton Region: Rideau: Brassils Creek at Paden Road. MAP:31B/13, UTM 18TVE 363.8 828.8. 44.99851N 75.80676W. 2 August 2006 TIME: 0854-1204. AIR TEMP: 27C, overcast, breezy HABITAT: small brownwater, bedrock Beaver creek, water 25 C, swampy thin-soil scrub. Once you feel like you've sampled all the habitat that's vulnerable to this kind of study, or have exhausted the time available, or have completely muddied the water, assemble everyone and sort out what you've caught, writing everything down in a journal account, and dividing the specimens that are to be released (after measurement & sexing), and those that are to be retained. Put the botanical specimens in the plant press that you did remember to put into the vehicle, or take them home in a cooler, or at least shaded from the sun in tied-off inflated bags. You also compose a description of the habitat, record the length of the stretch of the stream you've sampled from, and the departure time (alongside the arrival time) and anything else that seems noteworthy. Then you store the bags, pack the nets, get in the vehicle, and move on -- to the next site, or to home. At home, all the bags and plants are checked for labels, and the drift and shells go into the freezer for 48 hours, to kill anything that might crawl between samples while they're drying. Put the plants in the press that you forgot to bring in the vehicle. A couple of days later, thaw the samples, spread each to dry thoroughly in a newspaper-lined shallow box, and then store bulk samples in plastic bags or high-density polyethylene wide-mouth jars until they can be studied. Those familiar with the Ontario Benthos Biomonitoring Network (OBBN) of the Ontario Ministry of the Environment and Environment Canada's Ecological Monitoring and Assessment Network, will notice both differences and similarities with our method. We're focusing on the large creatures that can be identified to species in the field (herpetofauna and "macro"-invertebrates), while the OBBN uses a half-millimetre mesh to catch small animals ("meso"-invertebrates in our terminology) loosened by riffle-kicking and usually identified only to class, order, or family. As befits the larger and more scattered organisms we're targeting, ours is, within the site, a protocol for hunting, rather than for random sampling. Both methods depend on taking reference collections to constrain the uncertainty of field identifications, and on archiving data to make long-term revisits meaningful. Chapman, A.D. and J. Wieczorek (eds). 2006. Guide to Best Practices for Georeferencing.Copenhagen: Global Biodiversity Information Facility, 80 pp. Hutchinson, G.E. 1965. The niche: An abstractly inhabited hypervolume. In: The Ecological Theatre and the Evolutionary Play. New Haven, Yale University Press, pp. 26-78. Hynes, H.B.N. 1970. The Ecology of Running Waters. University of Toronto Press, Toronto. xxiv+555 pp. Latchford, Francis Robert. 1882. Notes on the Unionidae found in the vicinity of Ottawa, Ont. A.S. Woodburn, Ottawa. 8 pp., 1 figure. Whittaker, R. H. 1967. Gradient analysis of vegetation. Biological Reviews. 42: 207-264.